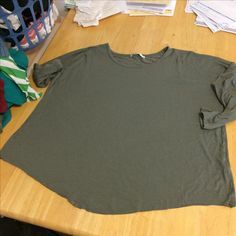 I found a really cheap rasher shirt at a (ahem) big box store for $7 and it was SPF50 fabric, so figured I couldn't sew for that. That was my starting point for a couple of swim sets. First is the skirted bottom, made from Gracious Threads' Eclipse Tankini set. I made size 3. The tankini top has the peplum in the pattern, so I just took the waist cutting line from the size down and sandwiched the skirt between the waistband and the bottoms - worked perfectly! Here's something fun I learned the last bottoms that I sewed for myself! You know how the gusset seam of swim bottoms can be enclosed by sandwiching between the front outer and front lining of the suit? 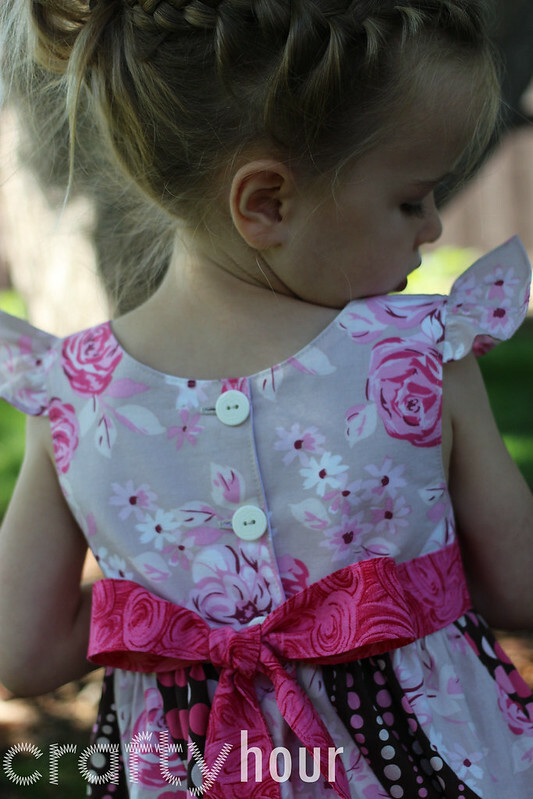 The same can be done with the side seams! This is a quick little mini tutorial on how to accomplish this. It was a bit tricky to show this well so I took a quick video to hopefully make it a bit clearer. 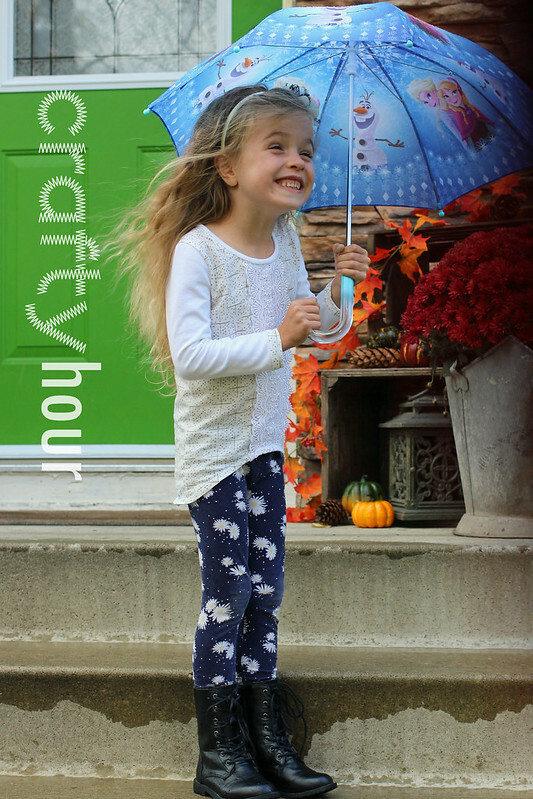 Next up is also a Gracious Threads pattern, the Swim & Surf Shorts. I think this pattern is genius! Perfect for a little girl (or a big one, like me, for that matter!) Swim bottoms with attached shorts. Exactly what she needs for playing in the sand and a little extra coverage from the sun. I'll update this post to include once they are finished! 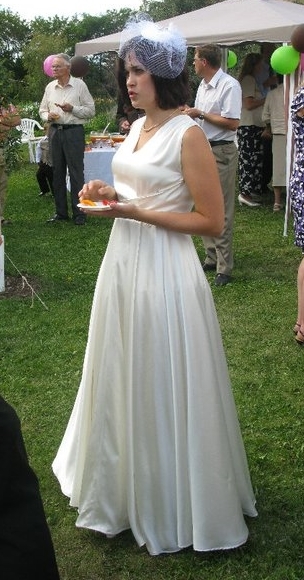 One of Emily's most beautiful creations is still her own wedding dress, a drapey, silk, retro-inspired gown. Hi. I'm Laura's sister Emily. I've been invited by her to contribute a bit to this blog with some of my own projects, and maybe collaborate a little on some. Whew! It has been too long. Spring and Summer flew past, full of family times and just life. 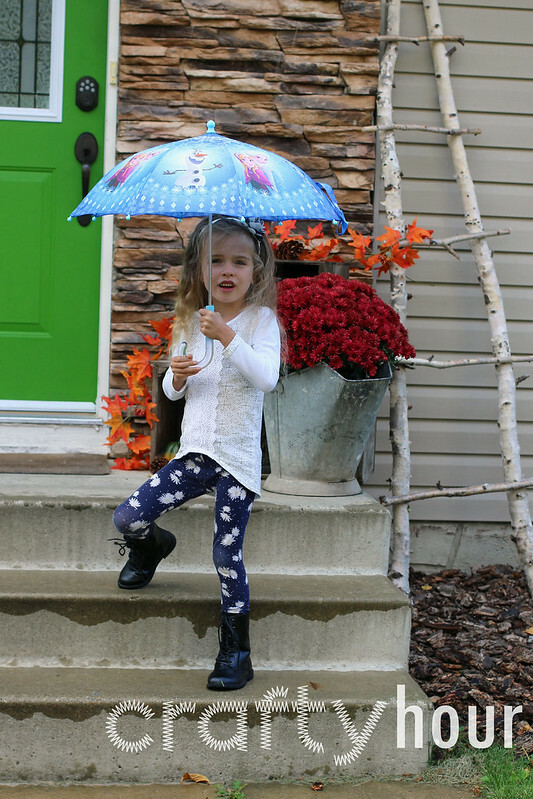 Now my front steps look like Fall, the kids are back in school, with my baby going to part-time kindergarten (! ), and schedules and routines have started again. 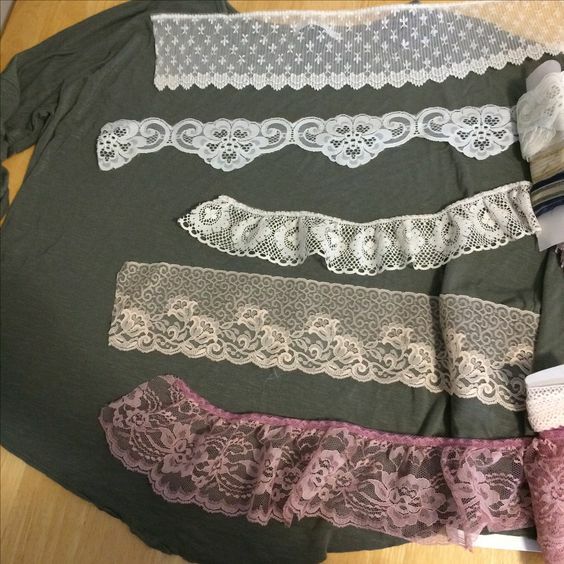 Fabric: White/gold is a tee-shirt of mine that didn't fit well, white is cotton lycra, white guipure lace. Mods: Cut the neck binding 2" longer than the pattern states, added folded cuffs as there was not enough fabric for sleeves otherwise. She is so excited I was sewing for her again! 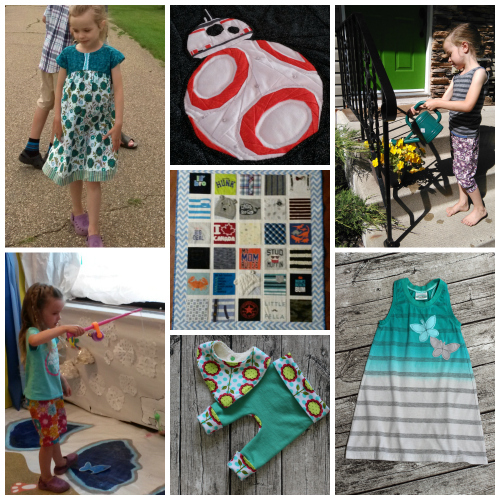 Deby from So Sew Easy asked me to review the book Stitch 'n Swap - find my review over at So Sew Easy this morning. As part of my review I tried out the book's pattern for a cute cozy to keep my second cup of french press coffee warm. 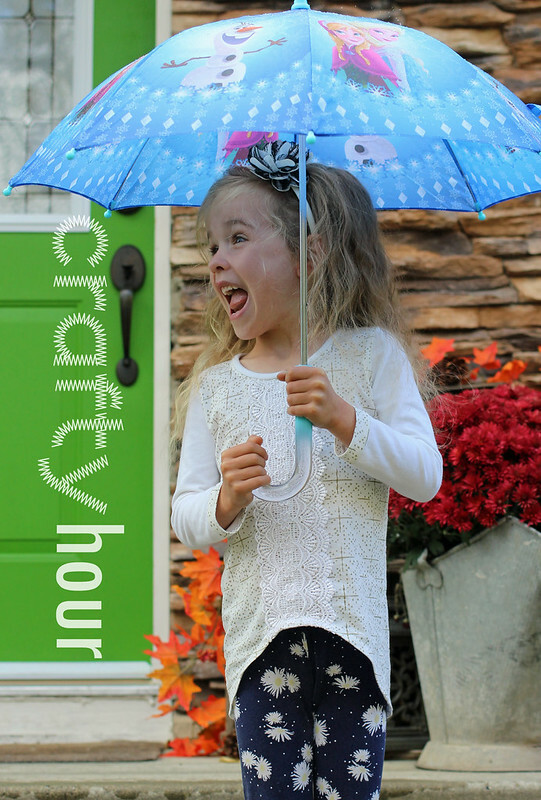 See more photos of this fun little cozy and the book review over at So Sew Easy. 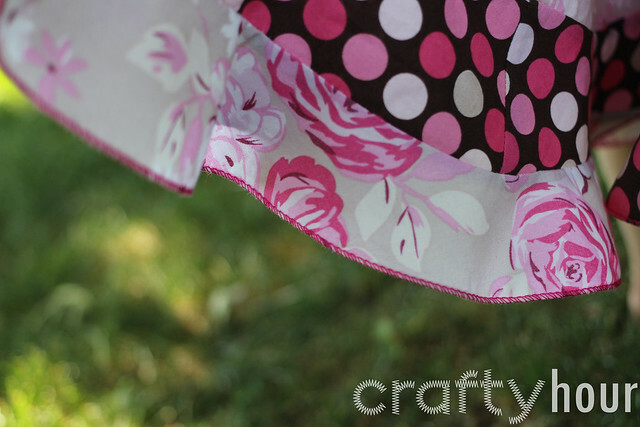 First I want to mention my article today over on So Sew Easy. If you've ever been interested in trying out these handy plastic snaps, check out how to install them and also see a number of ideas on where they can be used! 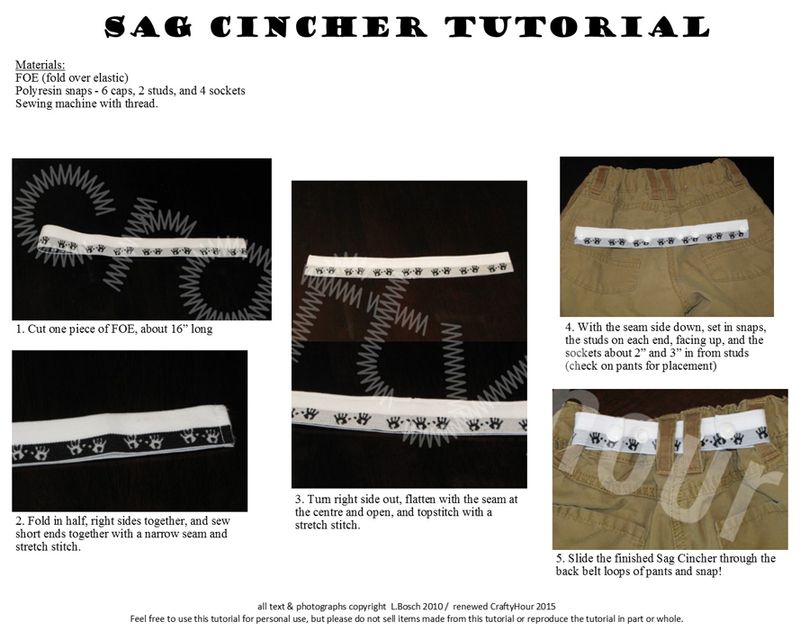 Scroll down to find my tutorial to make Sag Cinchers. Speaking of snaps: Years ago I posted a quick tutorial for making Sag Cinchers, my variation of those little elastic half-belts that help to hold up droopy drawers. That was on my old blog and it's not so easy to find anymore, so for those who have been asking, here it is again. Hope this tutorial comes in handy! I've used ours for over 5 years and they are still going strong. They even helped to keep maternity or transition pants on this mama! Another sister is getting married toward the end of the month! 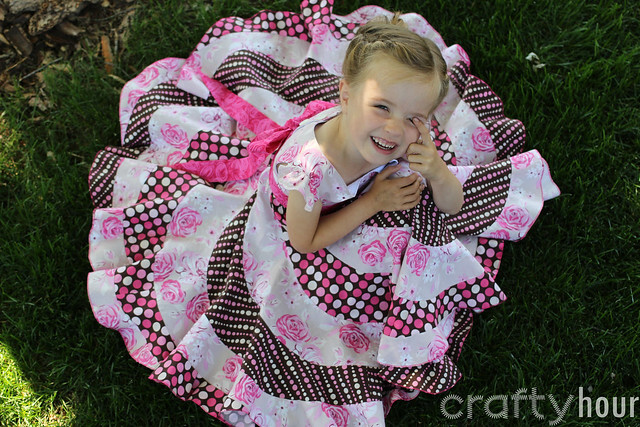 I finally got brave and tackled the Candy Castle Peppermint Swirl Dress pattern that's been on my wishlist since before Abigail was even walking! 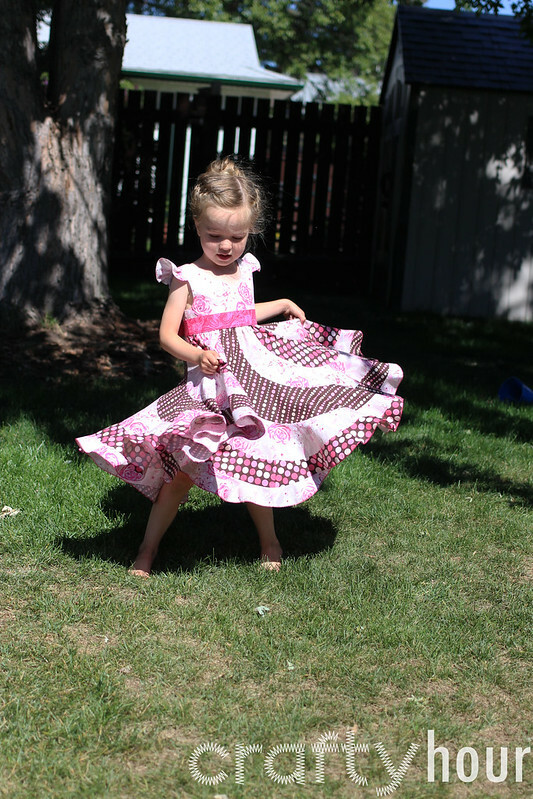 I made the size 3 slim, with the size 4 length and size 4 skirt. 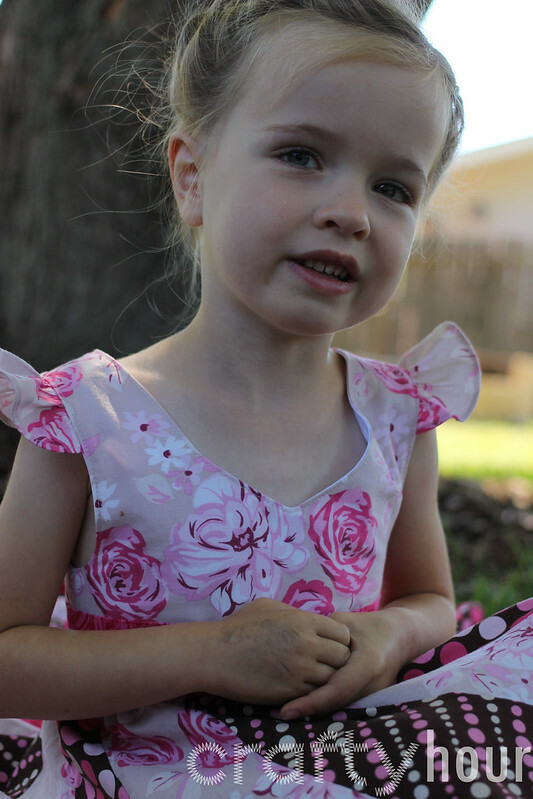 I also altered the armholes a bit, as a quick muslin showed that they would be much too deep on my skinny girl. The other modification I made was to change the neckline. The scalloped neck was too deep and the scallops in this size really didn't suit her shape. My pretty sweetheart! I used just 12 flounces instead of 14, as I just had three colours. Just cut the width at the top of each flounce a bit wider to keep about the same amount of gathering all around. Still makes a full circle - she loves it! One of my favourite parts, the rolled serger hem. Made it a very fast finish. The back - I had the perfect buttons in my button box - ivory-coloured with roses engraved on them. 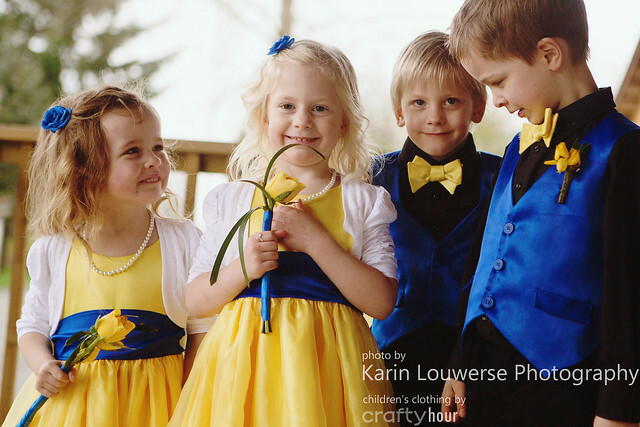 A Yellow & Blue Wedding! 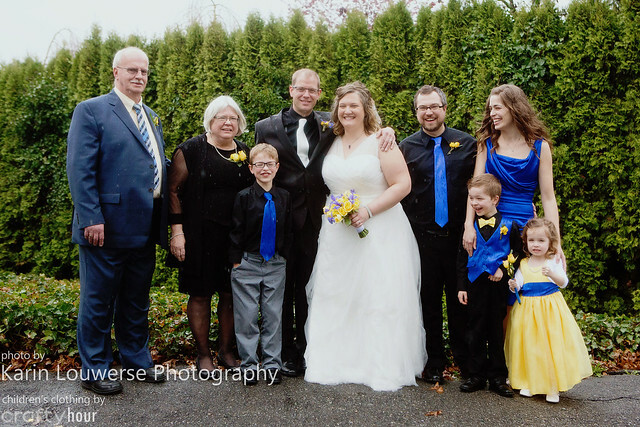 My husband's sister got married in March. 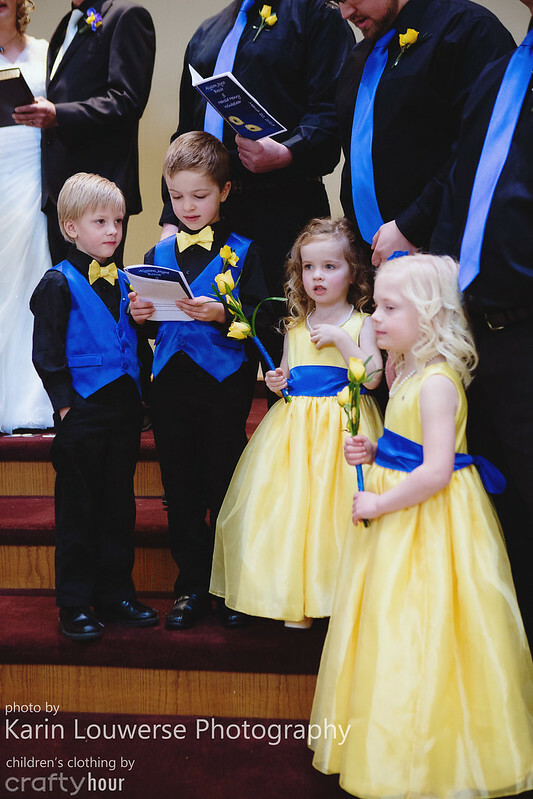 Two of our kids were in the bridal party, along with two other little people, so I got to do some fun sewing! 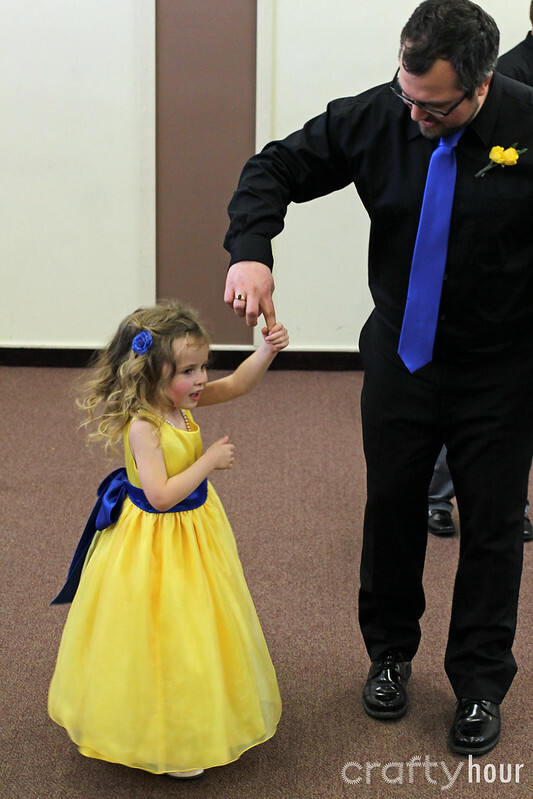 The other flower girl's mom and I used Vogue 7819 to make the two flower girl dresses. The dress has an organza overlay, a partial circle underskirt with a netting sewn on for volume, pleated sash, and invisible zipper. The satin was a little tricky to work with, but the result was so cute! I'm blogging over at Sew So Easy with techniques on working with sheer fabrics today. Click over to check out more details on construction of the dress. 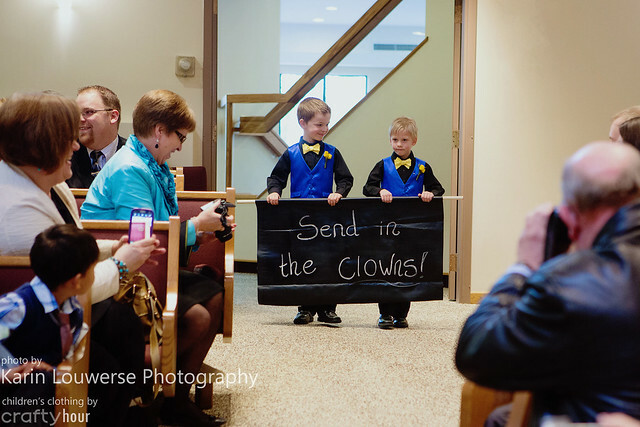 I used the Dapper Lad pattern by Ellie Inspired to make the vests for Benjamin and the other ring bearer (wait, I guess they were actually sign bearers! ), and this pattern, scaled down a little and with a slide at the back for the bowties. 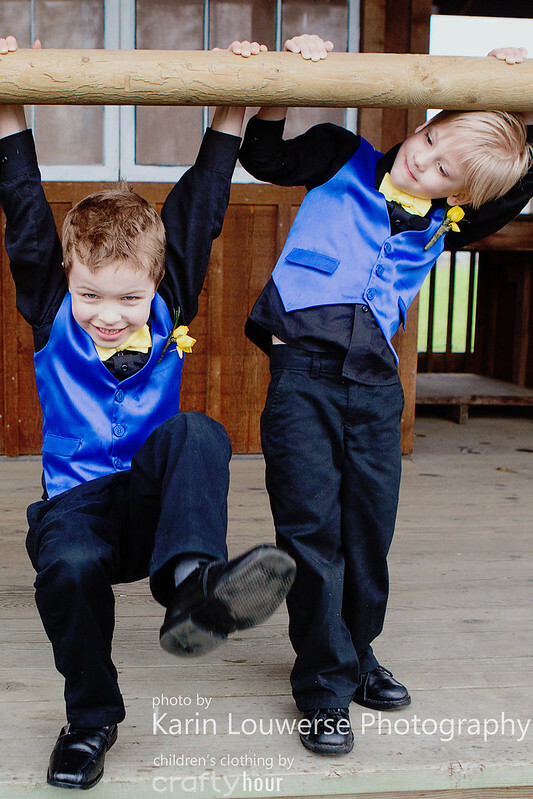 Hamming it up during the official photos - that's my handsome almost 6-year-old on the left! 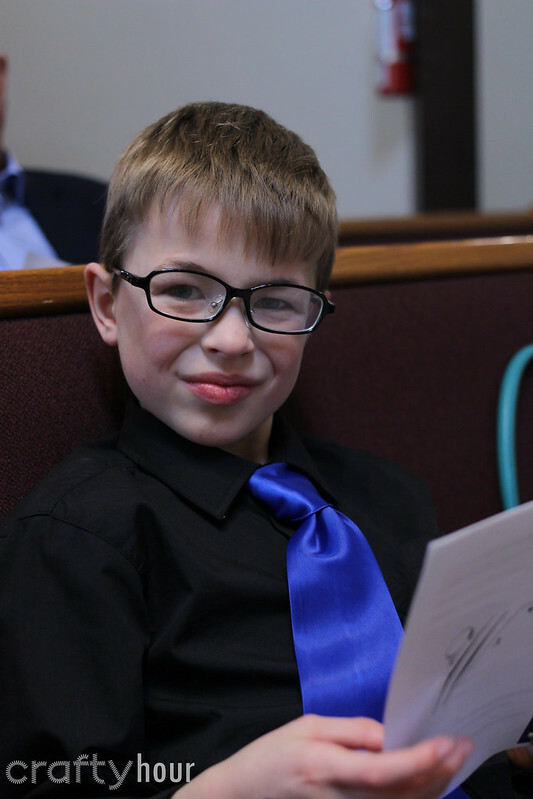 Of course Ian needed a matching tie - I used a white on yellow polka dot for the tie tip, just for fun. While I was working on the vests I took a couple of photos - thought I'd share them for tips on working with satin - look for a post very soon!